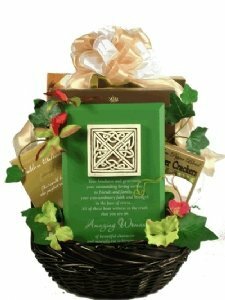 Pay tribute to the amazing woman in your life with this elegant gift basket designed especially for her. This gift will touch her heart and remind her of how much she means to you. "amazing woman" keepsake plaque (see image above for details) chocolate wafer cookies tiramisu flavored cream-filled chocolate wafers assorted European cookies chocolate delights cookie truffino (delicious truffle-like cookies) black forest cookies topped with creamy frosting chocolate-filled pastry roll cookies sweet popcorn mixed with almonds, cashews, pecans, chocolate and caramel rich and creamy chocolate covered cherry fudge Havarti cheese spread toasted sesame crackers.